We changed a few things and of course you should have noticed by now ;-) We received a few questions regarding the new version, you will find the answers to the most frequent ones here. If you shouldn't find your questions answered here, just post a comment, we'll try to answer it as soon as possible! Where do I find my friends list? How do I find my online friends? 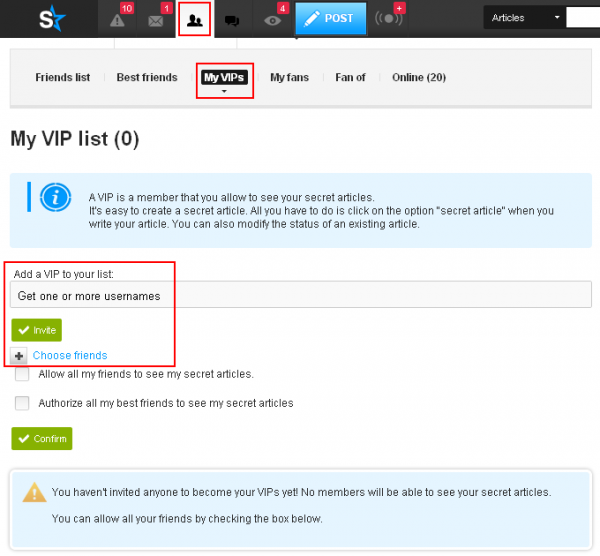 ★ You can access your friends list by clicking on the 'My friends'' button in your navigation bar, you'll find your friends list, your best friends, your VIP's, your fans and your online friends right there! Where did my Top friends go? ★ You can access your Top friends list by clicking on the 'Statistics' button in your navigation bar, simply click on 'Top friends' underneath your statistics. It seems to me, that loading pages and images takes much longer. ★ ﻿OK. We are already running tests to optimize that. How can I access all my articles? 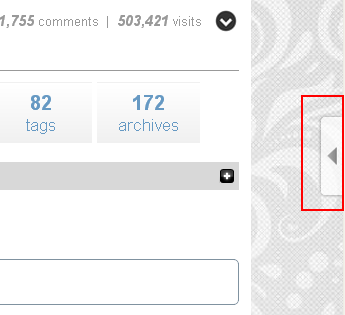 ★ ﻿﻿﻿Just click on 'POST' in your navigation bar to access all your articles. How can I change the skin of my blog? 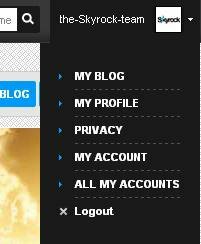 ★ We have to options for you: you can either go to 'My account' / 'My blog' / 'Skin' or access the settings directly from your blog. On the upper right corner you'll find a drop down menu with direct access to your skin settings. If you should come across any problems, let us know, we'll be there for you! For your info: this article will be updated regularly. You've been asking us how to get certain Awards... but lucky for you, there's already a blog that explains all that! *note* the Fiesta and Jason Awards were "limited time only" awards. This means that if you didn't meet the requirements on June 21st and Friday the 13th, respectively, it's too late! Originality, distinguish yourself with your original content! Quality, from every point of view. Work, if it's obvious you've spent a lot of time working on your blog, it's better. Respect, the general terms of service, but above all, the other users as well! ► The Good will always triumph! Visit others' blogs, and keep up on your recent visitors. Express yourself by leaving comments on subjects or articles that you like. Heart articles, profiles, don't hold back! Become a fan of your favorite blogs. Show up on the homepage by publishing a What's up ! ► You have to give in order to receive! 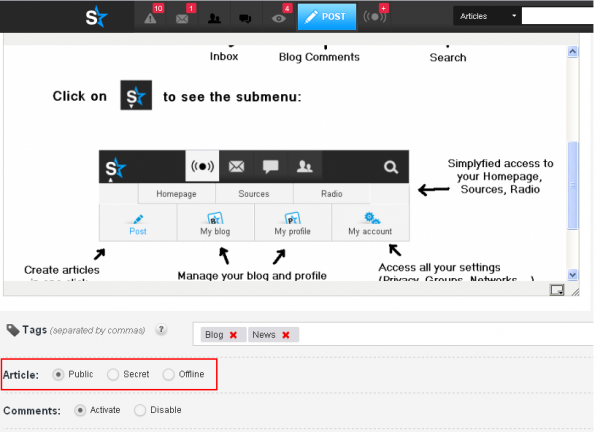 ♣ Popular: share your blog so the whole world can enjoy it! 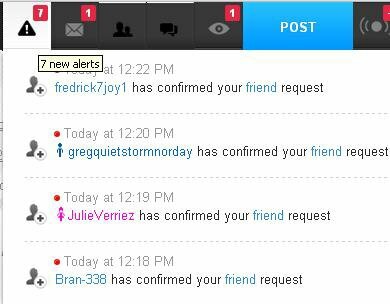 Connect your accounts Facebook and Twitter and keep your friends up-to-date on everything new on your blog and profile. Get a max of Hearts on your blog. ► If you reach for the moon, even if you fail, you'll be among the stars! You're in class, gone for the weekend or on vacation, but you want to continue to publish articles to your blog while you're gone? 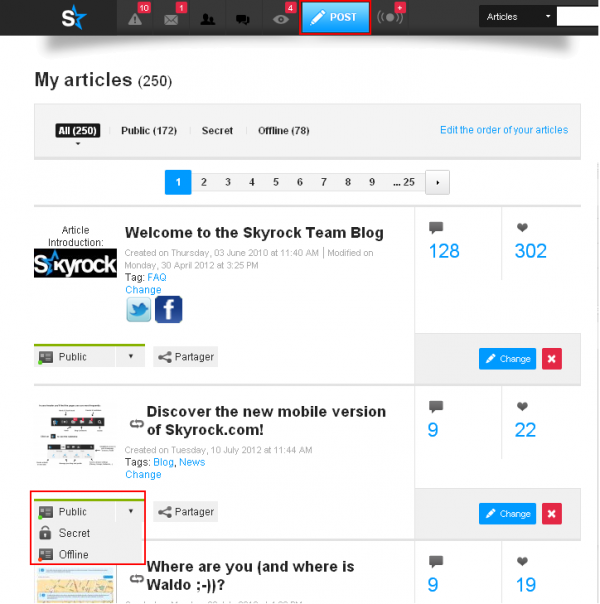 New navigation system: Access all of Skyrock in just one click! To access your blog, profile or account click on your photo at the top right hand corner of the page and voilà! It's all so easy huh?! ACCOUNT : How to change username ? But why change? It's how your Skyrock friends know you and you risk losing touch with them. If you really do want a new username then there's only one option – a new account. There's no need to change email address though : you can create numerous accounts, blogs and profiles using the same address! So why not keep your old blog for the memories and so you can still link to your favourite articles.